This routine has helped me many times when receiving drawings from others that include annotative blocks and text, you may not need as many scales that are applied to these annotative objects. Everything looks fine with the received file shown below. When I hover over the text and blocks it shows that there are more than one annotation scales applied to them. This is indicated by the two annotative symbols. Then you go ahead and select the annotative objects and that’s when these extra annotation scales start their fun. Even though you can manually delete scales from objects, it is time-consuming and can be prone to miss some objects. That is where this LISP routine comes in handy. provided by Irneb found [here]. When you are in model space, set your scale and then use this routine to purge out all of the scales except the current scale. Here is a simple explanation for how to load a linetype. I decided to demonstrate how to do so for an appropriate layer but a line type can be loaded from the “Properties” panel as well. Another dialog box “Load or Reload Linetypes” will display. It is from this long list of linetypes that you need to select the specific linetype. The linetype is loaded but it isn’t assign to the layer. So now that you are back in the “Select Linetype” dialog box, select the newly loaded linetype and then click OK. 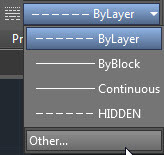 The loaded linetype can also be seen in the Properties palette and in the Properties panel of the ribbon on the Home tab of the ribbon. 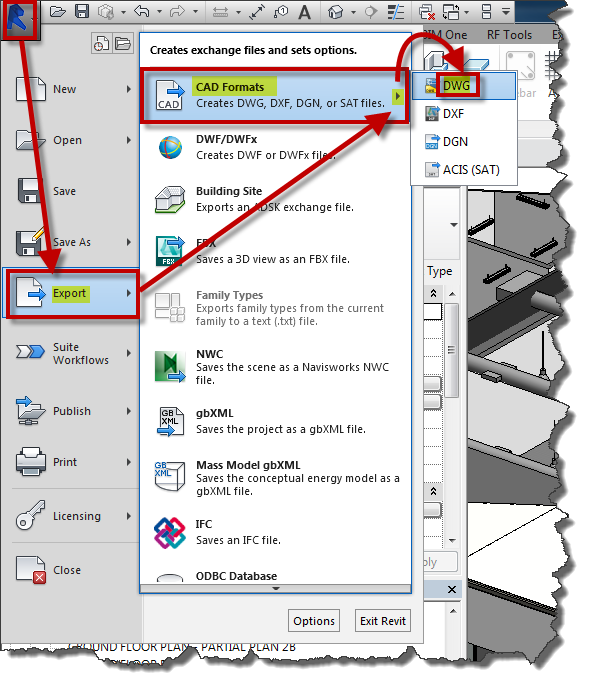 With the Revit model open, Click the Application Menu (“Big R”) > “Export” > “CAD Formats” > Select “DWG“. 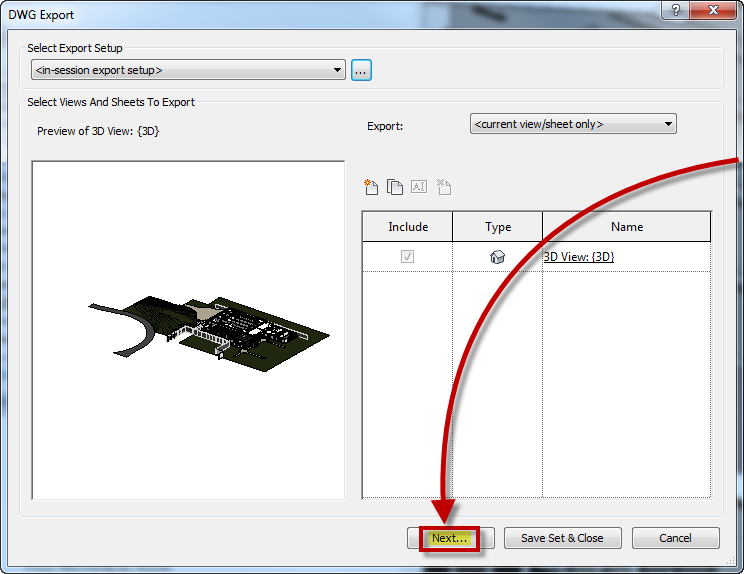 In the “DWG Export” dialog box – Click on the ellipsis (button with 3 dots) to open the “Modify DWG/DXF Export Setup” dialog box. 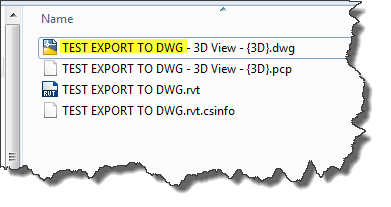 Define the folder where you would like the new DWG to reside and also give it a new name if desired. You can also define what DWG version to process it as. Click OK to proceed with the conversion. 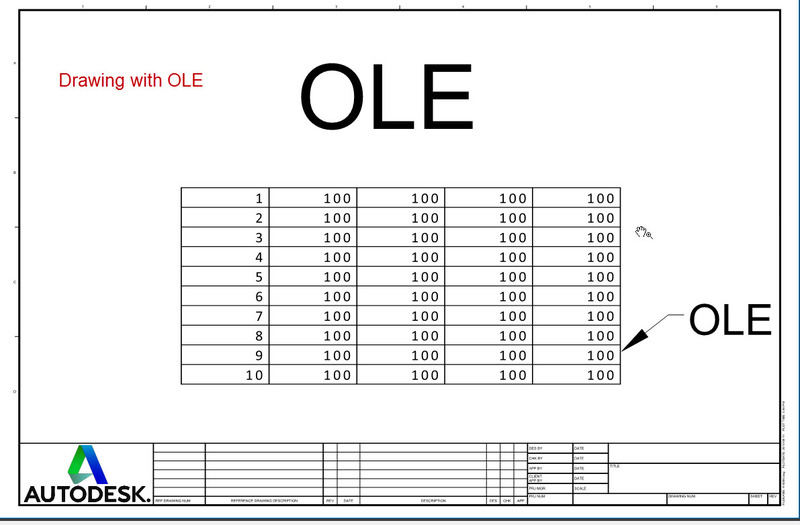 In the lower left of the Revit screen you will see a status bar showing you the progress of the conversion. Once it is done, notice the new DWG. 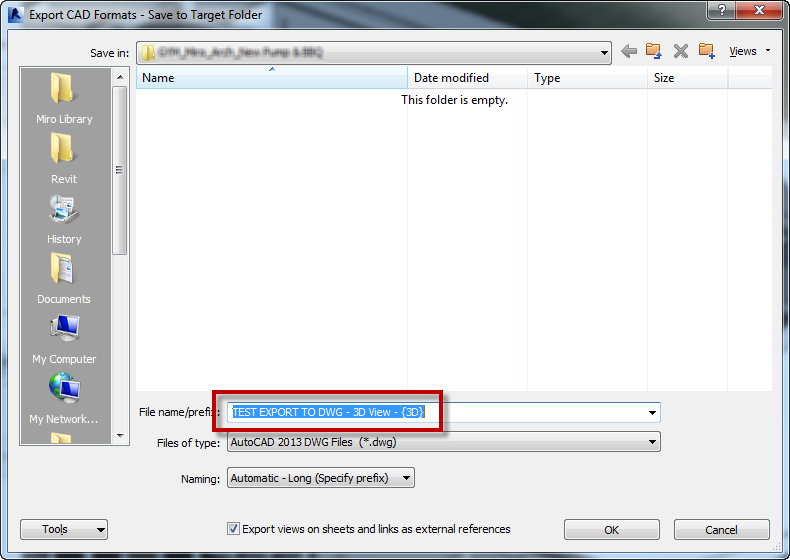 I will warn you that the Revit File to DWG conversion will make the overall file larger. The Revit file used in this example was 58mb and after the conversion to DWG was 70mb. 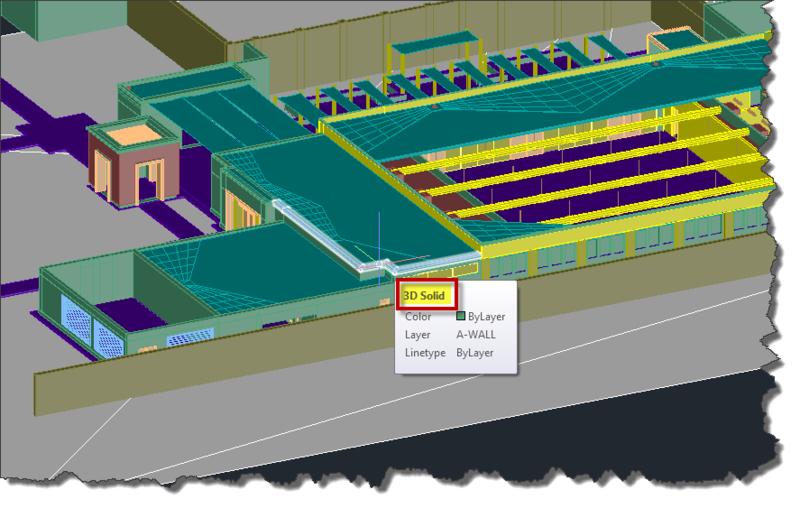 Now you can edit the converted file – Also note that the objects are AutoCAD solids. 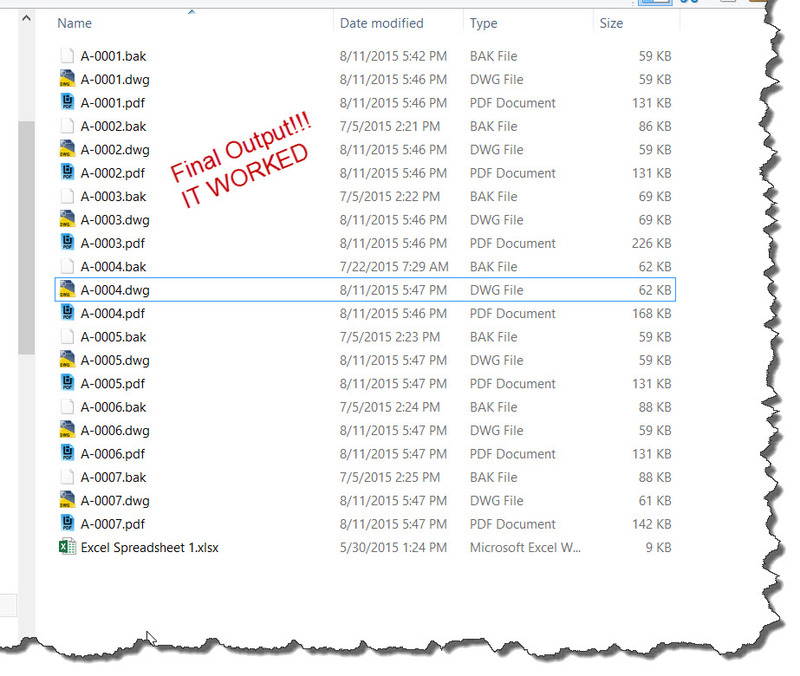 AutoCAD batch scripts can be powerful by themselves, but if you couple that with the ability to apply them to a multitude of drawings then it can be really powerful. I first saw the power of scripting while using the “Core Console” in 2013 and made a post about it found here. But then realized that there was some limitations and one in particular was its inability to process OLE objects. 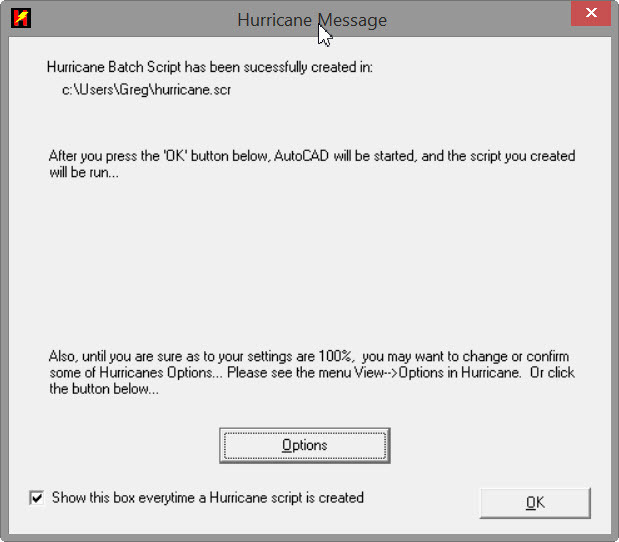 Script Pro is still pretty nice, but from my testing a batch processor called “Hurricane” I have grown fond of its built-in functions and scripts. There is a new version available called “Hurricane MX” but I have only used the older one which is just fine for me. So I decided to try a batch of drawings using Hurricane and sharing the results with you. Shown below is the folder of drawings to be processed. 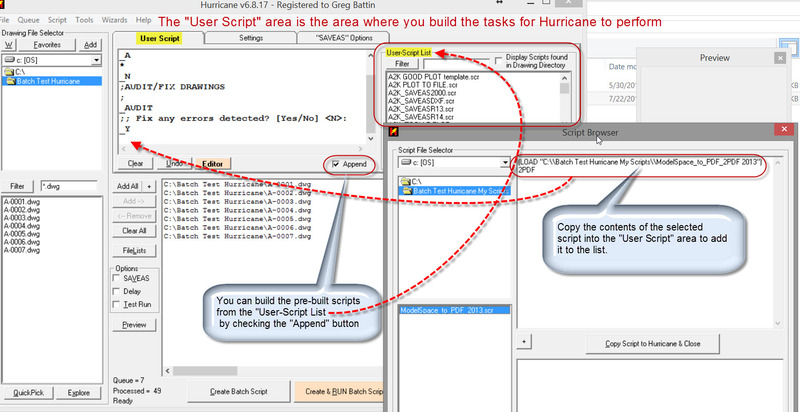 Build the script in the ‘User Script” tab by selecting some pre-made scripts found in the “User Script List”. If you plan on selecting multiple pre-made scripts – DONT FORGET TO CHECK THE APPEND BUTTON. As shown below, the program builds a single script containing all of the steps that you define for the drawings that you selected to be processed. NOTE – That you need to have a drawing currently open for the process to start. Just don’t have one of the drawings in the list of drawings that you are wanting to process open. And as a big relief – the drawing that contained an OLE object came out just fine.